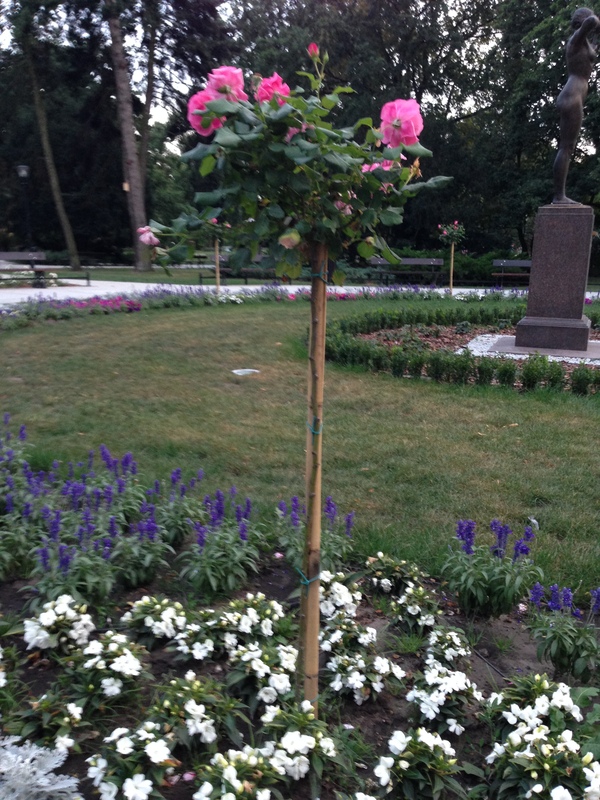 There are parks of all sizes scattered throughout Bydgoszcz. It’s not uncommon to go for a walk and pass through a park with people sitting on benches enjoying the day, eating lunch, strolling with babies…just relaxing. 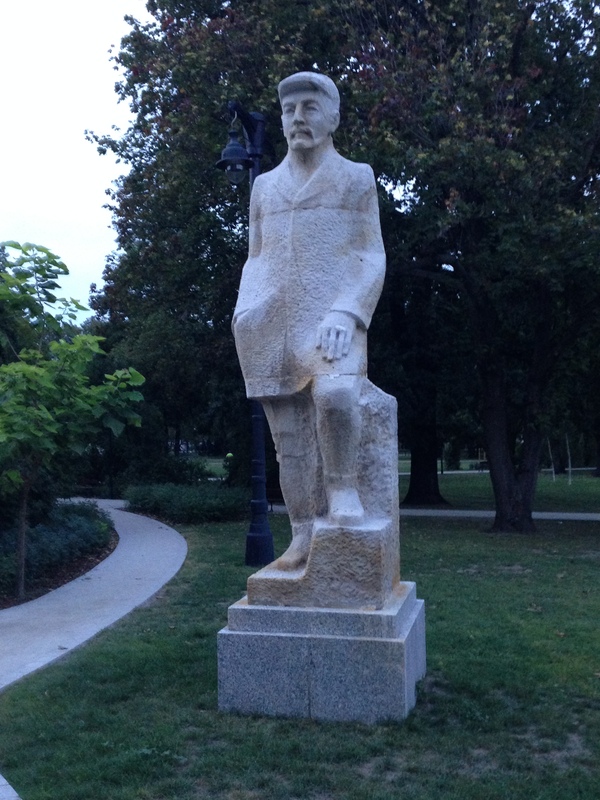 One of the parks had been undergoing a renovation and re-opened the last week of August, so David and I decided to take an evening stroll to check it out. 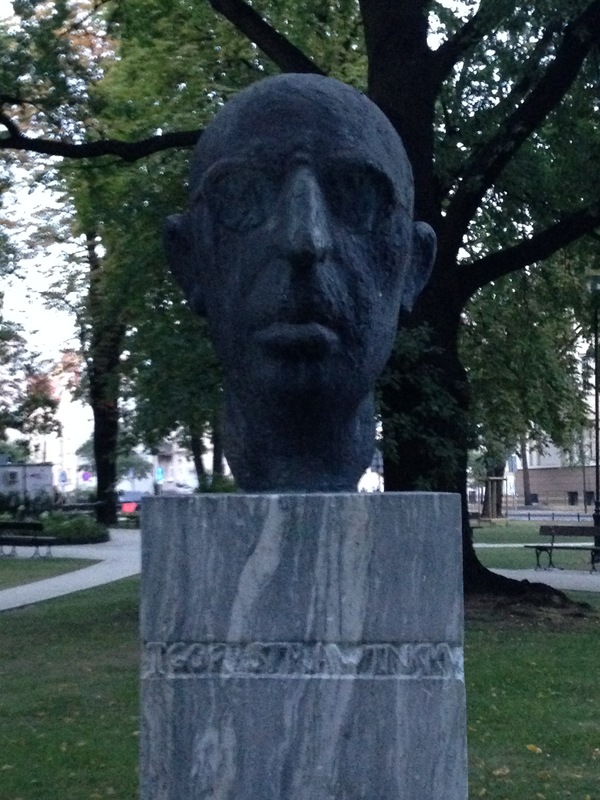 The park is called the Jan Kochanowski Park and is located in the “Music District” of Bydgoszcz. Here is the man himself right at one of the entrances. 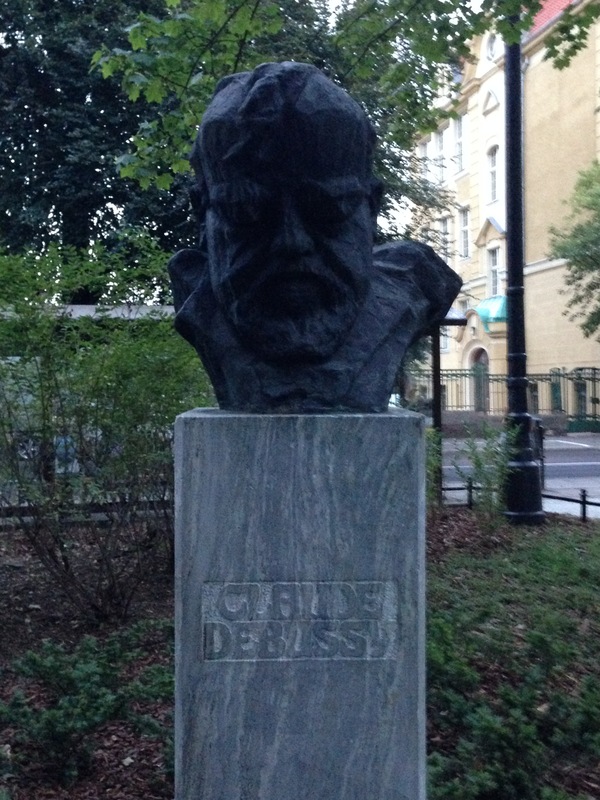 As the park is in the “Music District”, there are 15 statues of famous composers scattered throughout the park including Chopin, Bach, Beethoven, and these two fine fellows….Claude Debussy and Igor Strawinski (yes, that is spelled correctly…if you are spelling in Polish! The Polish “w” makes the same sound as the English “v”). Debussy looks a like he’s scowling and it almost looks like Igor has on aviator sunglasses! Ok, maybe that’s just my imagination. 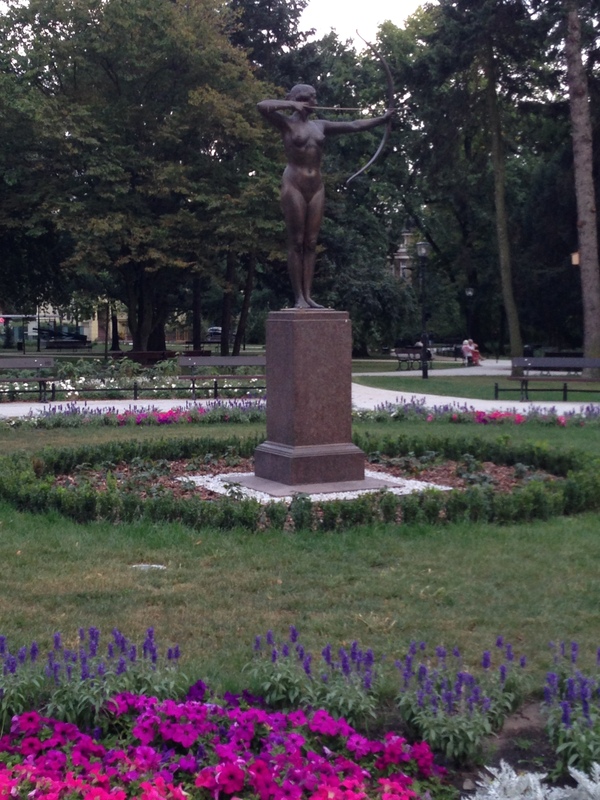 The park is also home to another symbol of the city, the “Archer Lady”, which was unveiled in 1910 and has apparently moved around the city in various spots before finally landing here in the park in 1960. David refers to it as “The Naked Lady Statue”. Here she is from the front…. and from the back….yep, she’s naked. She’s surrounded by a circle of beautiful flowers.as well as some creative landscaping techniques….roses on a stick anyone? 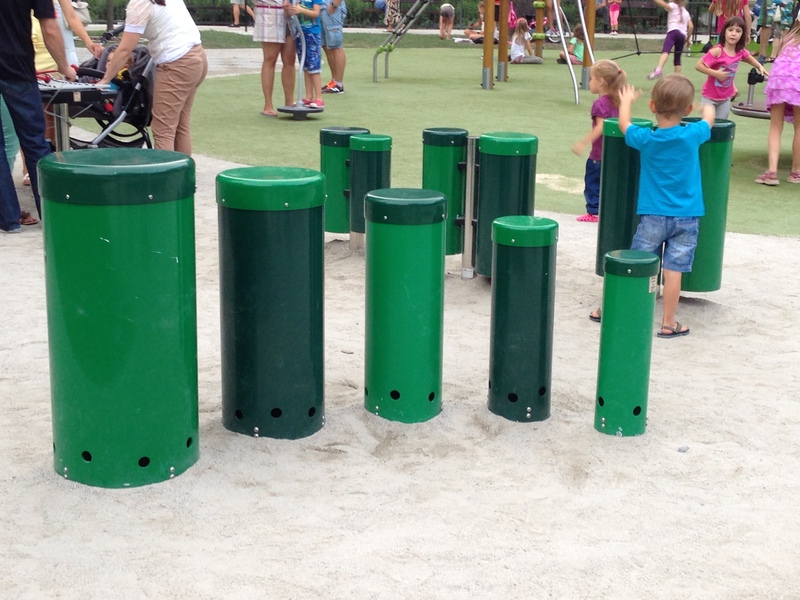 One of the things that make this park unique is that when doing the renovations they decided to add some musical instruments for people to “play” on. Remember this park is in the “Music District. 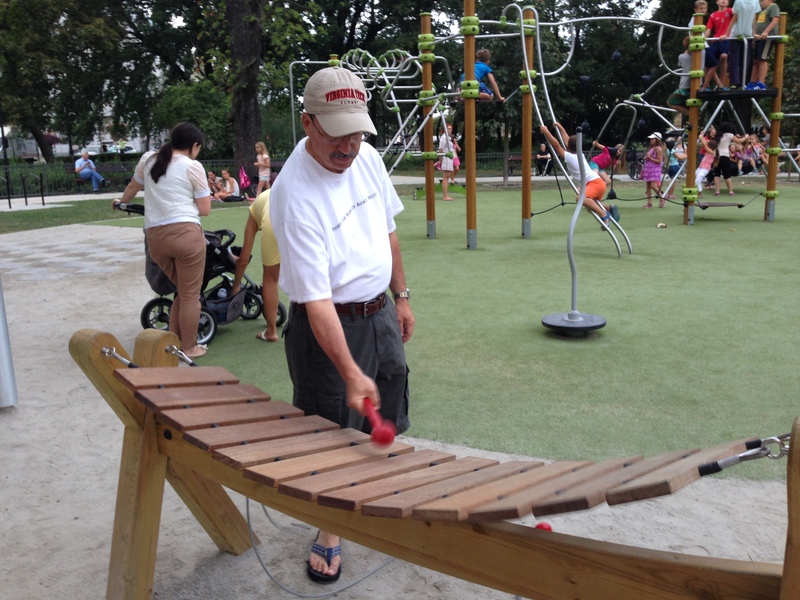 There are drums of all sizes… chimes, and a wooden xylophone. 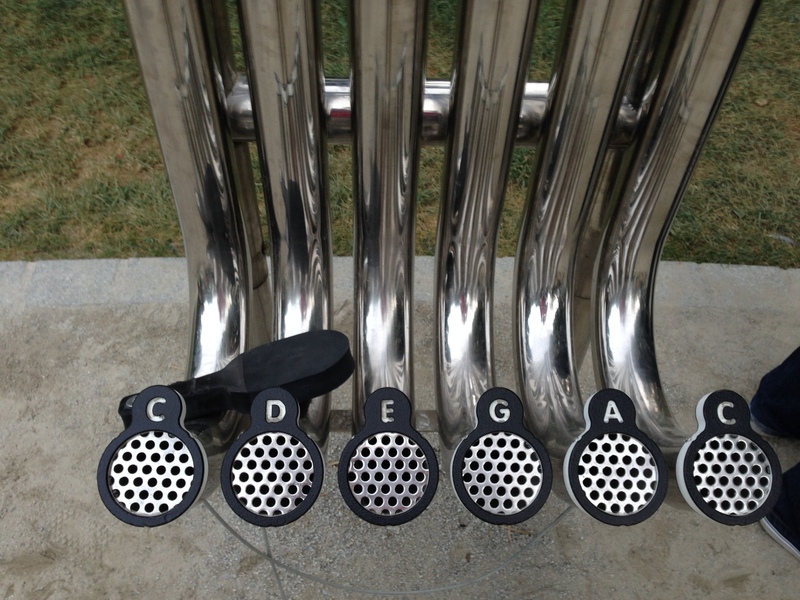 However, I think they need some help with their scales….a few notes are missing! And while it was a good idea, it might not have been thought out well. During the wee hours of the night people like to come in and “play” on the instruments, much to the displeasure of the residents who live in houses surrounding the park, including one of David’s co-workers. This is what my husband does when he’s tired of waiting for me while I take pictures….checking out the news on his phone, which he’s trying to hide in his hands. He’s a little blurry because I was on the other side of the “naked lady”…and was trying to zoom in and catch him in the act! 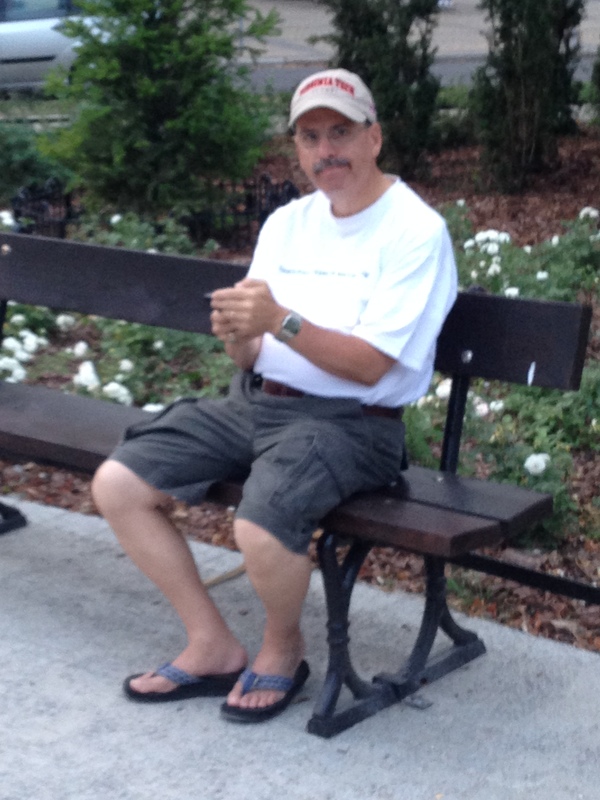 Although every now and then I get him to take a picture of me…you know, just to prove I was actually there. This time with a tree stump…it could be significant, because why would you renovate a park and leave a big tree stump in it if it didn’t mean something? Plus it has a little metal sign on it. 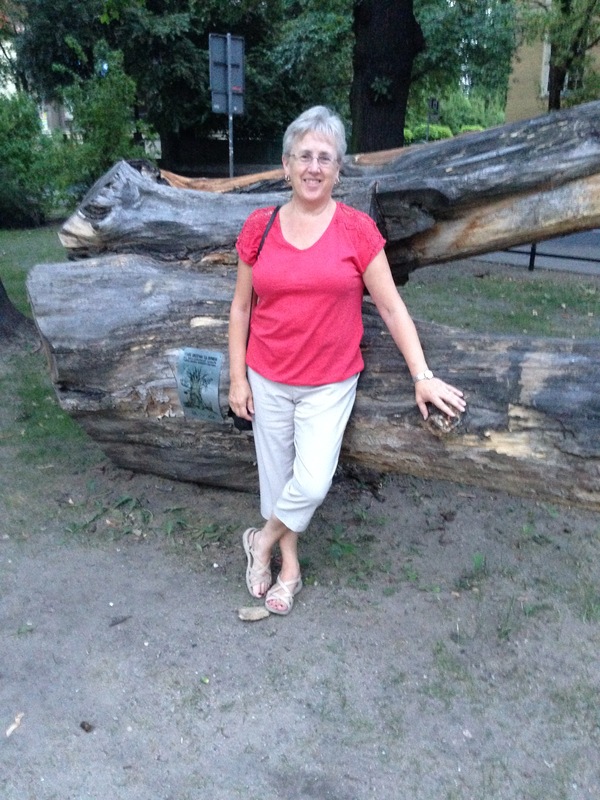 Probably says something in Polish like, “Don’t sit on this tree, it’s a national monument”. 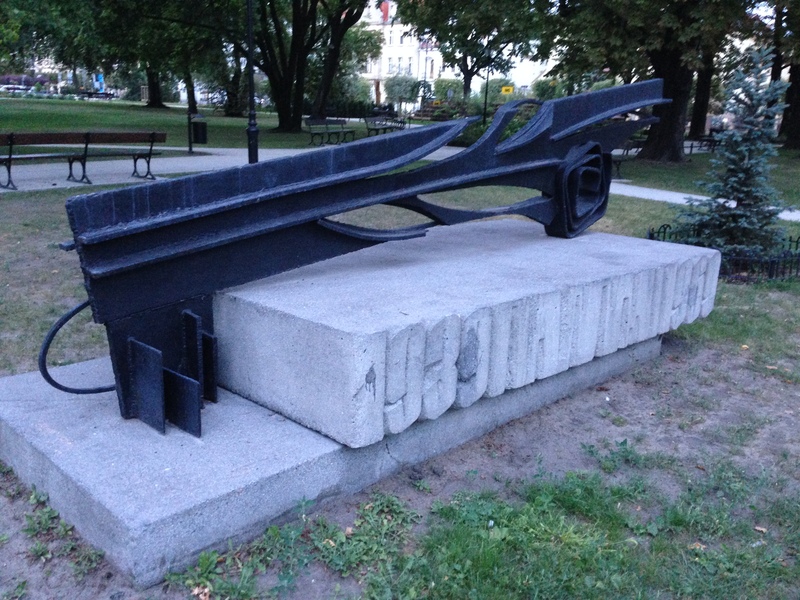 And for you history buffs…there is this sculpture….a broken rose, laying on it’s side. We had trouble figuring out what it was because from the pathway you’re looking at the back side and it doesn’t look like a rose at all from that view. Anyway, I did a little research. 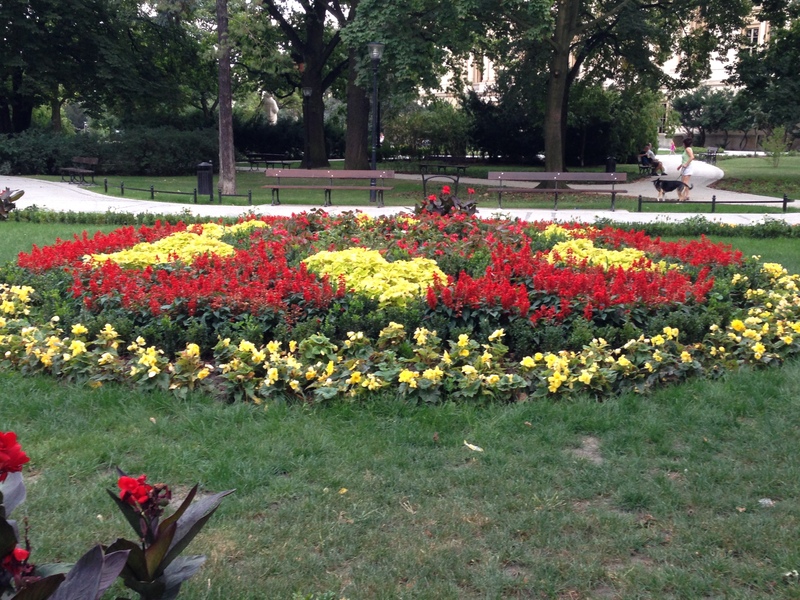 This broken rose commemorates the death of fifty students from the Male Secondary School who were killed on September 5, 1939, when German troops invaded Bydgoszcz and started carrying out mass executions of the city’s residents. 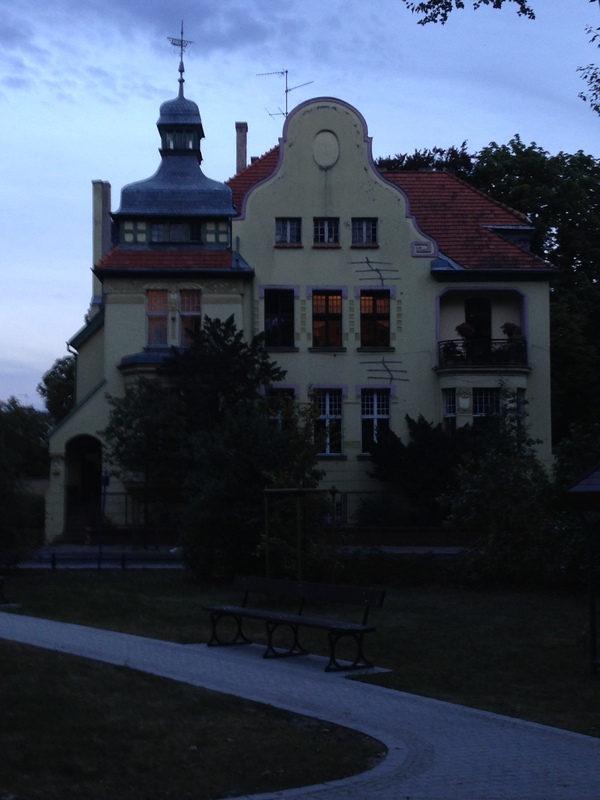 Near the park are several prominent Music Academies and universities, but it is also surrounded by beautiful homes built by well-known architects and the details on them are amazing. This is one example. 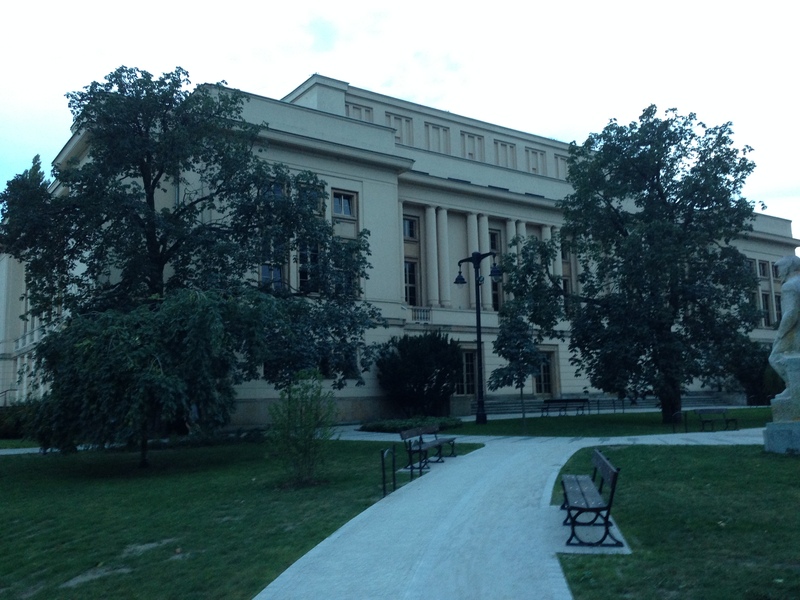 Across the street from the “Archer Lady” is the Polish Theatre and the Pomeranian Philharmonic, which was built in 1958 is on another side of the park. This is the side of the Philharmonic building that faces the park. If you walk down the sidewalk in the picture above and go to the right, you’ll find this…. 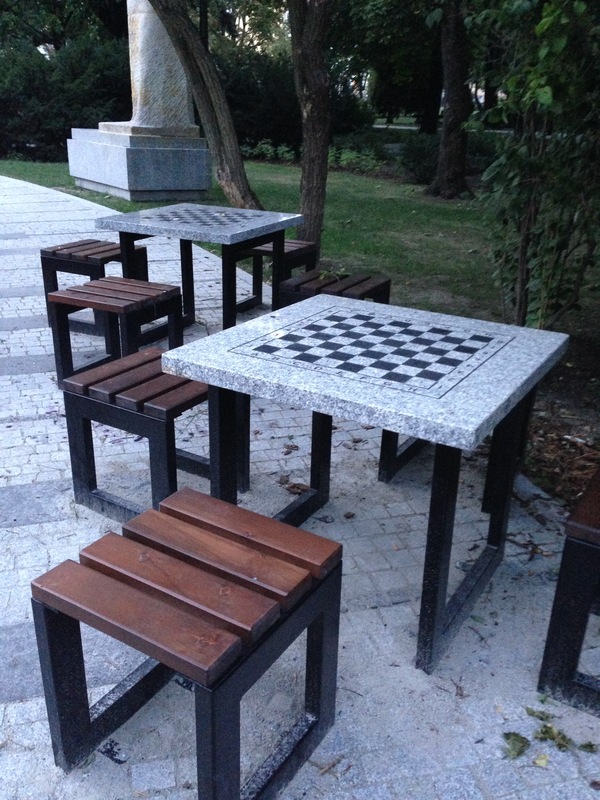 If you’re tired of walking around the park, you can sit down for a game of checkers or chess before you head home….hopefully you brought your own checkers or chess pieces….otherwise you’ll have to improvise with fallen acorns and chestnuts. Great walk in the park. Wish I was there with you. I’d love for you to be here. I know you’d like it just as much as we do! I love the idea a music park, but I can appreciate the neighborhood residents may not like “midnight serenades”! Beautiful park. Thanks for sharing your adventures with all of us! Glad you are enjoying reading about our adventures. It is a nice reminder of all the opportunities we have to see and experience new things while we are here. That was so beautiful Pat. BUT it’s not cool here, it’s going to be close to another heat record close to 88. Welcome to Florida but I was raised here and I should be use to it. Can you send some of that sunshine over to Poland? It’s been foggy (and in the high 40’s, low 50’s for almost a week!